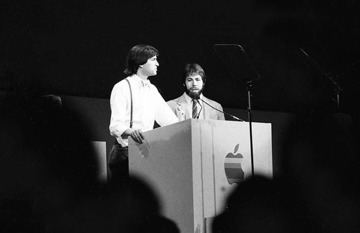 A set of photographs taken during Apple's 1984 announcement of the Apple IIc surfaced online on Thursday, showing company cofounders Steve Jobs and Steve Wozniak taking part in a media bonanza that would serve as a model of contemporary Apple keynotes. Recently unearthed by the San Francisco Chronicle, the photos of depict a large-scale showing at San Francisco's Moscone Center, a venue often used by Apple for product launches, conferences and other gatherings. The presentation, dubbed "Apple II Forever," was one of Apple's first attempts at spectacle-as-marketing. "Apple II Forever" took place just three months after the first Macintosh was released in January 1984. Though the portable IIc failed to gain traction with consumers, its splashy reveal would serve as a guide for future Apple debuts. The early event started with an iconically 80's video titled "Apple II Forever," shown on three large onstage screens. Set to a theme song of the same name, the short featured a slideshow of photos chronicling Apple's history and successes up to 1984, including the Apple I, a groundbreaking ceremony and the company's IPO. As the Chronicle's Peter Hartlaub points out, Apple might have contracted Pat Benetar to sing "Apple II Forever," a valid guess considering Michael Jackson was originally slated to close the show before pulling out at the last minute. Herbie Hancock's Rockit Band stood in for the King of Pop, according to John Dvorak, who covered the event for the Sunday Examiner/Chronicle. 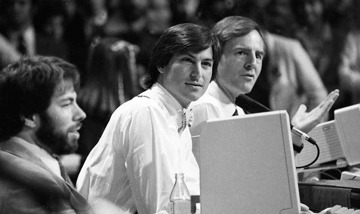 Jobs, Wozniak and then-president John Sculley took turns speaking onstage. Jobs discussed recent Macintosh sales numbers before turning to Apple IIc, the meat of the presentation. Like modern Apple keynotes, Jobs threw to Wozniak, who further detailed the IIc and its capabilities as a portable personal computer. Though the terminal lacked a monitor, it was relatively small and lightweight compared to its contemporaries. Interestingly, Jobs ceded the presentation's "big surprise" to Sculley. 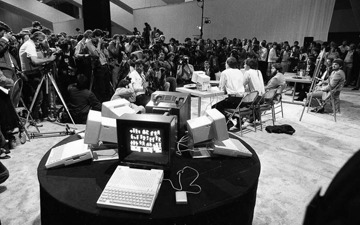 Apple employees carrying IIc terminals were planted among audience members, and when Sculley gave the cue, they held the computer above their heads, showing off its lightweight design. Following the presentation, the Apple executives met in a separate room to answer questions from the gathered media horde. 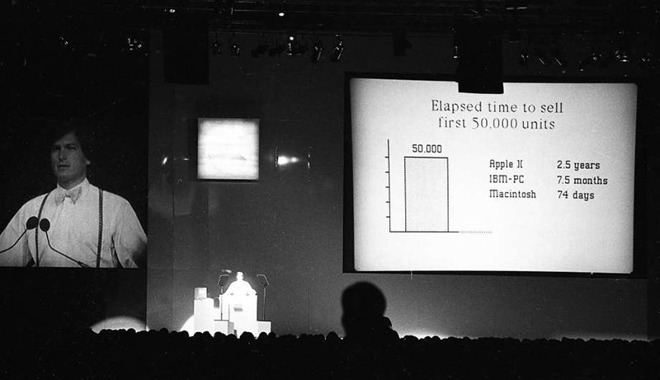 Similar to present day keynotes, Apple had set up a few IIc terminals with monitors as part of a practical demonstration. This latter portion was more structured than more recent product unveilings, at which Jobs, and now CEO Tim Cook, milled among reporters in the hands-on area. 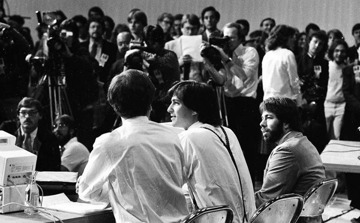 There are photos of Wozniak talking with the crowd following the press conference, however. Finally, Apple II Forever marked the debut of Apple's first ad blitzes aimed at children. According to Chronicle coverage of the event, one ad previewed during the event carried the headline "How to talk your parents into parting with $1300."